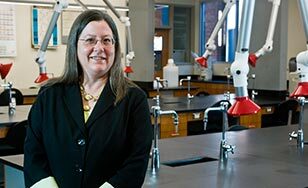 Aileen Beard hopes to accomplish many things as the College’s dean of the School of Sciences. One goal stands above the rest. “St. Scholastica is not a research university, but undergraduate research is an important part of preparing students for the world now,” she said. “It’s been done here for a while. I’m hoping to institutionalize it, to make it a reason students come here. “I plan to help the faculty become aware of opportunities out there. I’ll help find funding, and provide faculty the time to work with students. My primary goal is to have the Schools of Sciences be known as a place of creative, innovative teaching and strong undergraduate research. Beard’s doctorate is in organic chemistry, with a specialty in organic synthesis. She joined the College in 2012, coming from teaching at Benedictine College in Kansas. And what does the Benedictine way mean to her? Asked for an example, she rattles off several without hesitation. When the College dedicated the new Science Center addition at the start of the 2012-2013 academic year, she had been here all of a couple months. “Even though I didn’t have anything to do with that building project, they wanted me to be up there when the ribbon was cut,” she said. “I felt honored, and like I was at home. “During employee orientation, Sister Mary Rochefort” – associate vice president for mission integration – “talked to us about the Benedictine community and their values, and she sincerely invited us to be a part of that. That was very powerful. Fostering interdisciplinary learning is another goal. “This doesn’t have to be within the School of Sciences. I want to engage real-world problems. For instance, sustainability. What about combining biology and economics? One of the possibilities is to have a learning micro-community in which a group of students takes several courses along a theme, in a way that brings out the interconnections between disciplines.